I’ve been blogging for The Big Comfy Bookshop (and have been friends with Michael) for almost 2 years now. The shop itself has been a home from home, and a place to harness my creativity (mostly in the form of my Harry Potter Discussion Group.) Michael helped to fuel all of this and has been a massive support to me blog-wise, so I thought I would offer him the opportunity to pass on some of his thoughts to you… through the medium of my blog. Like some kind of circle of life… thing. Anyway, over to Michael! What is it that first inspired the thought of owning an independent bookshop? A combination of visiting Lichfield ages ago and seeing the bookshops there, and the film High Fidelity. I wanted to control my own hours, whilst being somewhere pretty calm and inspiring. 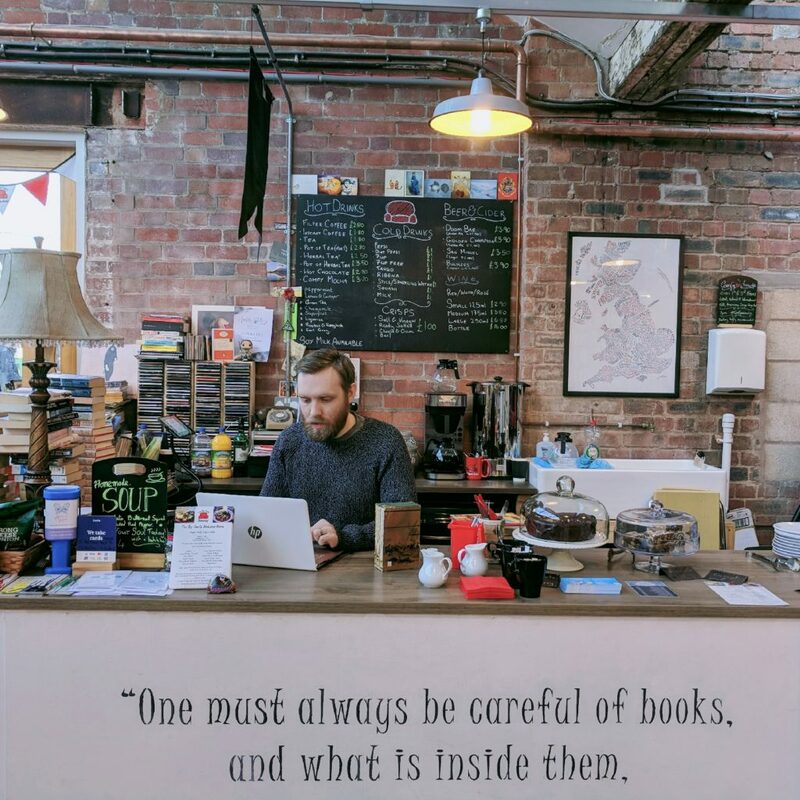 What did you aspire for your bookshop to be? I wanted to imitate my own personality in a shop. Calm, bit messy, kind of lassaiz faire attitude. the overall grand vision was to be a centre of creativity, a meeting point for like minded people. Not just a retail space. What do you struggle with most when running the bookshop? EVERYTHING! Ha, no in seriousness it’s the balance between how much I have on and how much time I spend with my family. Family will always come first, and there have been times when I’ve had to shut early, or even for a few days, which hits the pocket as I’m not earning. I have brilliant colleagues in Ali and Eve who cover so much, sometimes at the last minute, and now I have Abi helping at weekends too. It’s a great team and one that without, I’d probably only be able to open 3 days a week! If you could have any author visit your shop, who would it be? I dig Cormac McCarthy but I reckon he’d intimidate me a bit too much. Being a parent I’d love to have a good chat to Julia Donaldson. What book(s) have you had handed into the shop that made you go WOW? I had about 10 first edition signed David Gemmell books in immaculate condition, just handed to me. We don’t really specialise in rare or signed books so was unsure what to do! So I took a picture, stuck it on Instagram and sold all but 3 now! Tell us something your customers would be surprised to know about you. I have a degree in music production and recorded and produced a few albums, got signed to a massive USA label, toured the UK, then opened a bookshop. What is the most underrated genre of books? They all have their fans, but in ‘the general public’s’ eye, YA (young Adult) is always seen as vampires and werewolves. It’s not, it’s so rich and deep. the ‘Chaos Walking Trilogy’ is one of my favourites ever, along with His Dark Materials. What do you hope for the bookshop this year? The number one goal is to let people know it exists. Our marketing budget is pretty much zero, so we have to rely on word of mouth, interviews (thanks!) and general good will. We’re battling the City Centre, Retail Parks, the Internet. In the perfect world I’d love to have a steady stream of people from the second I opened to the second I closed. I’ve started a Youtube channel to help spread the word too, about what goes on here, so that’s another focus. Wow, you must be super busy keeping that going! 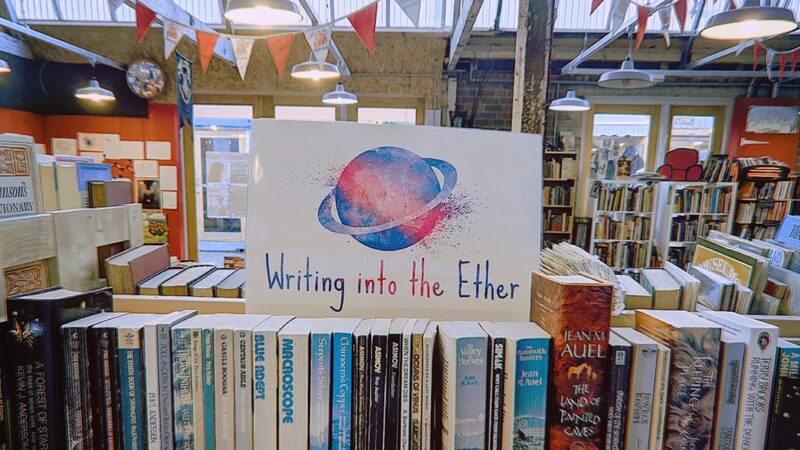 The day to day running of the shop is kind of left in the hands of Ali and Eve, the pricing and shelving of books etc, whilst I try to sort events, press, promo. That in itself is a full time job. It’s quite easy to go through teems of emails, pay invoices, add some Facebook events then go home without even looking at the shelves! What would you say to people aspiring to launch their own business? My one, big piece of advice is to START. There is never a perfect time. Don’t wait for it. You’ll only ever keep putting it off. I wanted to start a YouTube channel for over a year but waited for the right camera, the right recording equipment… In the end it was a friend who just said ‘Let’s do it this Wednesday’ (Thanks Dom! ), so went in straight away. If you have a 9-5, once you’ve finished for the day, turn on the laptop and start at 7 pm. Create a twitter, instagram etc. Search for similar people and strike up a conversation. Just start! I second that! Dreams don’t work, unless you do! Thank you, Michael! 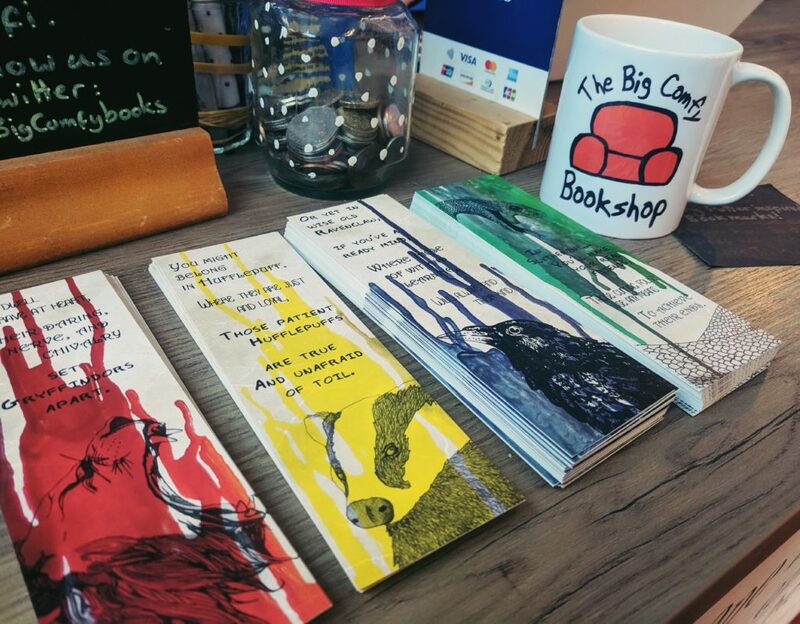 Everyone else in Coventry, do yourself a favour and visit The Big Comfy Bookshop to see all the amazing things they do for the community in Coventry. You might just find something magical! Check out my post about just how much this little independent bookshop has done for myself and my friends here. Harry Potter book club would be so much fun! I wish there was one here where I live. Michael seems like such a nice guy and I do love how you portreyed his shop. Hope he does well and a lot of people hear about this place. this is such a wonderful idea for a post, Amy! I’m such a huge fan of independent bookshops for many reasons – supporting real people, the character that each book has, the cosiness and comfort of the store, and the fact that prices are always far more down-to-earth! the only tricky part is not leaving the store with half of their stock! I love to interview independent businesses! <3 I know, I had to actually stop myself from buying more books and instead I make it a mission to give back books to the shop whenever I visit! I felt a twang of guilt when reading this as it made me realise just how little I support small business “in real life”. I try my best to support my friends who have online shops, but forget about the independant stores that exist locally (and even not locally). So thank you for going behind the scenes and for giving us a chance to know the person behind the book store! Side note – that thing about Michael being signed to a label really surprised me!